NYC, 04/13/2019, 10:00AM. 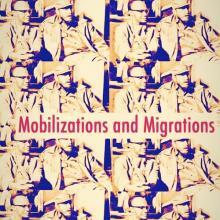 Mobilizations and Migrations. However the international order is characterized, it is clear that various forms of internationalism are in distress. These are at work both in producing violent conflagration and in generating moving populations across the globe (migrant labor, refugees, asylum seekers, exiles, emigres, etc.). How, then, can internationalism be thought and articulated anew? How can it productively and creatively address various modes of encounter and representation? How can it build on radical genealogies of international solidarity in ways that interlink vital discussions of borders and walls with the systemic relations of racial capitalism and its spatial fixes in the current conjuncture? The conference will bring together activist scholars/scholarly activists from across the disciplines and beyond in order to figure new dimensions of mobilization as and from migrations. The focus on movement and movements offers the possibility of constructive dialogue on specific spatial constellations in the present that does not lose sight of their historical constituents and political differences yet is willing to meet the challenge of their articulation.